I'll begin with a positive note: Deepak Chopra's new book, The Third Jesus, has a well-designed, eye-catching dust jacket. Now the negative: the rest of the book is not nearly so attractive. Not even close. In fact, it is often downright ugly, in a New Age fundamentalist, Christian bashing, intellectually vapid, historically dismissive sort of way. Worse, The Third Jesus has been praised by a number of Christians, some of them well known "progressives" such as John Shelby Spong and former Catholic priest Matthew Fox. A few of them are Catholic. For example, Father Paul Keenan, the host of "As You Think," a program on The Catholic Channel/Sirius 159, says, "In The Third Jesus Deepak Chopraunfolds for us the spirit of Jesus and with a reverence that is at once simple and profound makes his spirit accessible to us in our everyday lives." Perhaps Fr. Keenan didn't actually read the book. I hope that is the case, for if he thinks the Jesus conjured up by Chopra has anything to do with the historical, biblical Jesus worshiped by orthodox Christians, he needs to find a copy of the Catechism of the Catholic Church and shore up his knowledge of Christology 101. The message of Jesus was clear, simple and direct. But within a generation of his passion it was compromised in order to accommodate the widely conflicting views among those who claimed to follow him. ... In contrast to a message originally intended to inspire people to the wonders of a world reborn in God, the emphasis nowadays makes it almost impossible to think of Jesus or even Christianity itself except in terms of the suffering savior who died to appease God's anger against us. The terrible toll this emphasis has exacted on the message is sensitively treated in a most compelling way in this very valuable new work. Simply put, the Christ of Christianity is not the Christ of Chopra. The use of Ledwith's bio is misleading, giving the impression that a Catholic priest of some repute and in good standing with the Church readily endorses Chopra's book. This small but not insignificant instance of misusing facts is but a tiny taste of the sort of misrepresentations, distortions, and outright "did he really write that?" 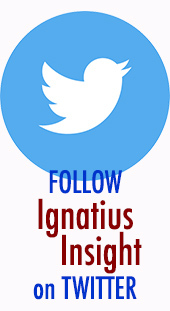 howlers soon to follow. The Third Jesus consists of three main parts. The opening part, "The Third Jesus," presents Chopra's Christ and urges readers to abandon the Jesus found in the Bible and Church teaching. 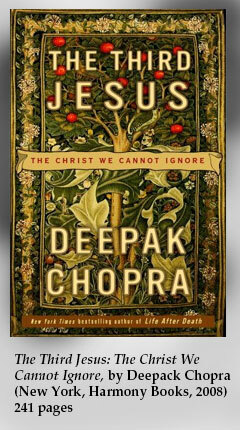 It is this section, less than fifty pages long, which outlines the essential points of Chopra's understanding of Jesus. (It goes without saying that this "Third Jesus" shouldn't be confused with the "Third Quest", which reflects some of best New Testament scholarship of the past few decades. If there is one thing this book shouldn't be confused with, it is good New Testament scholarship. Or any sort of good scholarship.) The second part, "The Gospel of Enlightenment," interprets various sayings of Jesus, including some from the Gnostic "Gospel of Thomas, and concludes with a section titled, "Who Is The 'Real' Jesus?" The final part, "Taking Jesus As Your Teacher: A Guide for Seekers," offers fifteen steps to "God-consciousness" and concludes with a withering attack on orthodox Christians—"fundamentalists," in Chopra's simplistic estimation—titled, "What Would Jesus Do?" To better appreciate what this means, we need to back up and consider the three versions of Jesus described by Chopra— two false and one true, he claims. The first Jesus "is historical and we know next to nothing about him" (8). Chopra employs contradictions in striving to do away with this Jesus. "The first Jesus was a rabbi who wandered the shores of northern Galilee many centuries ago. This Jesus still feels close enough to touch." And yet, while he seems so close and knowable, he is completely unknowable. Why? "This historical Jesus has been lost, however, swept away by history" (8). You might rightly wonder: Whatever does that mean? Does it really mean anything? (In most cases the answer is simply "No, it doesn't.") It is apparently intended to be pithy and devastating, but it actually sounds like something a high school freshman might write in a thousand-word essay titled, "What I Learned From The Da Vinci Code This Summer." Granted, Chopra's remark about history is absurd, but it is also significant: absurd, since it makes no sense (imagine someone writing, "The historical Julius Caesar, Richard the Lionhearted, and George Washington have been lost, however, swept away by history. "); significant, because it sets the tone for the entire book, which overflows with these sorts of squishy non sequiturs. Not that Chopra is consistent on this point. Far from it. Over two hundred pages later, readers are informed, "History may blur Jesus' biography, but it can't put out the light" (217). So, which is it: swept away or merely blurred? Chopra's argument—using the term with deliberate looseness—is that "the first Jesus is less than consistent, as a closer reading of the gospels will show" (8). He is either unaware or dismissive of the fact that Christians have long grappled with the "baffling contradictions" personified by Jesus, and have concluded (putting it very simply for sake of brevity) that if we could fully understand everything about Jesus, it would strongly suggest he was not divine at all. Besides, it's not as though "consistency" is much of a concern for Chopra. Chopra's lack of interest in the many writings of Christian theologians and scholars is readily apparent in his dismissal of the "second Jesus," who is "the Jesus built up over thousands of years of years by theologians and other scholars." This Jesus, Chopra flatly states, "never existed" and "doesn't even lay claim to the fleeting substance of the first Jesus" (9). At this point Chopra provides some comic relief, saying that this supposedly non-existent Jesus created by the Church "is the Holy Ghost, the Three-in-One Christ, the source of sacraments and prayers that were unknown to the rabbi Jesus when he walked the earth". (9) Some questions come immediately to mind: If the historical Jesus has been "swept away by history" (just three paragraphs earlier! ), how do we know what was known or unknown to him? Where does the Catholic Church teach that Jesus is the Holy Spirit? What does Chopra mean by "Three-in-One Christ"? Is he referring to the Trinity? Has he read even one basic manual of Christian theology? Considering that the only post-apostolic Christian thinkers named in his book are Dante (in passing) and Kierkegaard (a brief mention of Either/Or), I'd place bets on, "No. Never. Absolutely not." A mere nine pages into his nicely designed tome Chopra makes some inadvertent but strong arguments for deserving to be awarded and named "New Age Fundamentalist of the Year." Fundamentalism, as it has come to be generally described (for better or worse), is characterized by a simplistic world-view, an arrogant sense of moral superiority or self-righteousness, a refusal to take seriously other viewpoints, a dislike for scholarship and nuanced thought, a selective and often tenuous relationship with reason, chronological snobbery, and a dislike for the Catholic Church. All of these qualities are here, overflowing and in abundance. I'll highlight just two here. But I'm fairly confident that even the most dense of these backwoods Bible-thumping rubes would recognize that you cannot praise "the simplicity of Jesus's words" and then, half a book later, say, "Anyone can devise a new interpretation of the New Testament. Unfortunately, this great text is ambiguous and confusing enough to support almost any thesis about its meaning" (139). The reason for Chopra's disdain for theology—from the Greek words theos (God) and logia (discourse or discussion) seems simple enough: he doesn't like thinking logically about God—or at least the personal God of the Jews and the Christians. And when Chopra encounters an argument or position he disagrees with, he simply dismisses it: "Theology is arbitrary; it can tell any story it wants, find any hidden meaning" (136). Chopra's own arbitrary methods and findings are apparently exempt from any such criticism. Which brings us, at last, to The Third Jesus, or Chopra's Christ. This is the Jesus who "taught his followers how to reach God-consciousness." This Jesus was "a savior", but "not the savior, not the one and only Son of God. Rather, Jesus embodied the highest level of enlightenment. ... Jesus intended to save the world by showing others the path to God-consciousness" (10). Then, having already claimed that the historical Jesus cannot be known and that the second Jesus is a nasty lie, Chopra offers an unconvincing olive branch: "Such a reading of the New Testament doesn't diminish the first two Jesuses. Rather, they are brought into sharper focus. In place of lost history and complex history, the third Jesus offers a direct relationship that is personal and present" (10). But if the historical Jesus cannot be known and Jesus of doctrine and theology is a fabrication, how can they be "brought into sharper focus"? And upon what evidence does Chopra construct his portrait of Jesus? As noted, Chopra doesn't reveal much about the sources he used, but I suspect they are a combination of Jesus Seminar-like works, radical feminist texts, neo-Gnostic tomes, and a Google search for praises such as "homophobic fundamentalist Christians" and "fundamentalist Christian zealots." Whatever Chopra's sources (there are no footnotes, nor a bibliography), they apparently aren't much interested in the first-century context in which the Gospels are written, especially the Jewish context, which any and every biblical scholar of any heft acknowledges as essential. Yet apart from occasionally mentioning Jesus' conflicts with various religious leaders and some comments about Jesus' forty days in the desert, the explicit Jewish character of the Gospels and the Bible at large is given short shrift. Chopra simply assumes that large chunks of the New Testament are historically inaccurate, written by followers of Jesus who eagerly distorted and manipulated their master's words for their own ends. Of course, no evidence is provided for these important assumptions: no arguments are given, no scholars are quoted, no effort is made to show how and why Chopra accepts one verse as authentic while dismissing others as somehow distorted or corrupted for ideological, dogmatic ends. Call it a low level variety of the "hermeneutics of suspicion." Or call it convenient, self-serving, and dishonest. Either works. In addition to his strange claim that Christians believe Jesus is the Holy Ghost, Chopra makes other glaring errors. For example, "Jesus calls himself the New Adam" (15). No, he doesn't. In fact, the only use of "Adam" in the Gospels is in Luke's genealogy. The term "new Adam" doesn't appear in the New Testament; rather, Paul compares the "last Adam" (Jesus) to the "first man, Adam" (1 Cor 15:45). Yes, Jesus is understood to be the New Adam (see Catechism of the Catholic Church, pars 504, 505, 539), but the Gospels don't record Jesus referring to himself in such a way. Having quoted from John 8 ("I am the Light of the world..."), Chopra attempts to provide the context: "Jesus had entered Jerusalem for the last time. Within hours he would be arrested by the Romans..." (22) Wrong. That was still some time away, as the Feast of Dedication had yet to take place (Jn 10:42), as well as raising Lazarus, (Jn 11), the triumphal entrance into Jerusalem (Jn 12:12-19), and the Last Supper discourse (Jn 13-17). Chopra claims that "Jesus railed against the law..." (23). Wrong. Jesus praised the Law—it was the misuse and abuse of the Law that angered him. He said, "Think not that I have come to abolish the law and the prophets; I have come not to abolish them but to fulfill them. For truly, I say to you, till heaven and earth pass away, not an iota, not a dot, will pass from the law until all is accomplished" (Mt 5:17-18). And Jesus, insists Chopra, "didn't dramatize the End of Days", which will come as a surprise to those familiar with Matthew 24 and 25, Mark 13, and Luke 21. He describes the pre-Christian Paul as "a worldly skeptic," which directly contradicts Paul's clear testimony about his zealous adherence to Judaism (Acts 26:4ff; Phil 3:4ff;).